Name Brand Discount Basketball Shoes. Save money on discount basketball shoes without sacrificing quality. Cheap prices don't have to mean poor workmanship or performance. There are lots of incredible deals online for cool popular brands like Nike, Adidas, Air Jordan, Fila, New Balance and more! If you're like me, you try to stretch your money as far as you can. You may have multiple kids playing a variety of sports. And with each sport comes another pair of shoes! As fast as young kids grow and while they're still in the process of exploring new sports, you probably don't want to invest a whole lot of money in a pair of shoes that may only get a couple months use out of them. Before purchasing, I highly recommend taking advantage of the basketball shoes review provided by customers. They'll let you know straight up how the shoes fit and how they hold up. You may find that different brands run slightly different in their sizing. That's been my experience. And also, women's basketball shoes fit very differently than men's. Mainly, women's shoes tend to be narrower. I've actually worn both throughout my career, depending on the brand. Check out the product description as well to ensure you're purchasing a shoe made from quality materials that will provide good support, durability, and traction on the court. The popular name brand shoes listed below come in a variety of colors, styles, and sizes. Looking for black, green or pink? How about high top or low top? The latest Air Jordan? The availability of sizes and colors are always changing, so keep checking back. 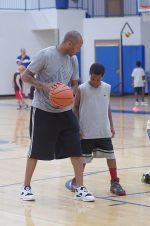 I always played in high top shoes because I felt like they provided me the support and stability around my ankle that I needed. However, low top basketball shoes are popular with many players. Be careful not to get a running shoe. They typically don't have the wide base you need on a good court shoe for all the starting, stopping, and changing direction. If you're willing to spend a bit more and don't need discount basketball shoes, you can customize your own. If you're an Adidas fan, visit miadidas. Get the James Harden shoe with your own personalized changes. If you love Nike, go to NIKEiD. There you'll find the latest Kobe Bryant, LeBron James, Kyrie Irving, Kevin Durant, and Paul George styles. Customize their shoes in your favorite colors. Or for Under Armour fans, visit UA ICON. They allow you to upload your own image to put on your shoe along with choosing your own patterns and colors.